We love play dough and usually cant get enough of it. We not only buy it in the stores, but we enjoy making our own too. I have one trusted recipe I use for most of our homemade play dough. That might sound boring but don't worry, we find fun ways to make it new and exciting each time. You can add scents and colors to this play dough to give each batch a unique experience. That is just what we did when we made our Coconut Sand Play Dough. This was a new and unique playdough for us and it is by far one of my boys favorites right now. I am still stuck on the Cucumber Melon Play Dough we made but mommy is out ranked by the kids. After we made our coconut play dough we set out to find a few fun ways to play with it too. 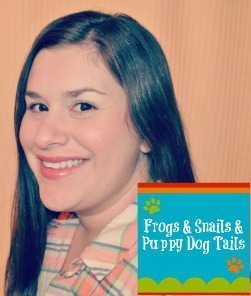 I'm excited to share what we did with you and hope that you and the kids can have some play dough fun too. To make coconut play dough follow the link for our favorite homemade play dough above and then just add coconut extract while cooking it. We left out glitter this time and added sand to the finished playdough while playing for a fun texture and great sensory experience. A tray, bowl of play sand, seashells, glass stones, and our homemade coconut play dough. If you do not want to make homemade playdough you could just try adding sand to white play dough. You will not have the scent but you can still have the fun texture while playing. I set everything out on a tray (from the Dollar Tree). I then had my oldest 4yr come to the table to play. We flattened out the play dough and added the sand to it, kneading it together. We then flattened it out on the tray. My son decided to start by making a face with the shells and stones. This is one way you can play with the play dough. Once he was through making faces he decided to completely cover the playdough with all these shells and stones. Now we had a fun Play Dough Masterpiece. I recently saw a wonderful seashell craft on Local Fun For Kids and wanted to make our own version so we took our play dough and made sand playdough ornaments out of it. We flattened the play dough and took a glass cup and used it as a cookie cutter to get a circle shaped ornament. Then we used a straw to make a hole at the top (to add string or ribbon later). Lastly, my son added seashells and stones to the play dough. Then we left them to dry out for a few days. Next, we added some ribbon so we could hang them up. 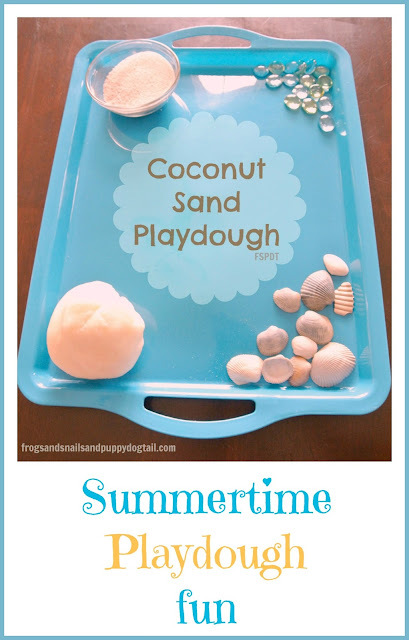 I am sure there are lots more ways to play and create with this Coconut Sand Play Dough. What would you and your kids do with this invitation to create? Hi, I'm Jaime. I am an everyday stay-at-home mom. I have 3 boys ages 4 yrs. to 8 months old. I love to find fun activities, crafts and recipes for us to do together. I then enjoy sharing them with others in hopes they may find something for their family to enjoy too. My blog is Frogs and Snails and Puppy Dog Tails. You can also follow us through our Pinterest, Facebook, Twitter, Sulia, Google+ and our G+ community, All Things Kids. thanks so much for having us over to share today! Did the stones fall off the ornaments once the dried? (especially the round stones) They look very pretty. Looks awesome and how fun to find Jaime here today! you have lots of great posts! Really like this one - we do lots of things with play dough as well and love how adding scent creates an additionally sensory experience.